Add custom tags to your tasks to organize on another level. Filter List and Board View to see exactly which tasks are most important. ClickUp makes adding Tags to tasks as simple as possible, and managing them even easier. 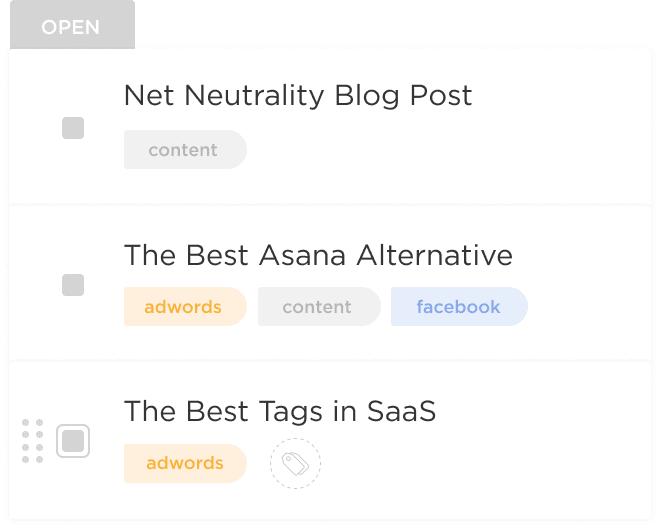 Tags are localized to each Space - meaning you can customize Tags for different Spaces so you don't have a never ending list of Tags. You need tags when tasks could have multiple labels. Because a task can only have one status and only exist in one location, tags give you that extra dimension on which to organize your tasks. When you need to, you can filter tasks by the tags they contain. View all tasks in a Project or Space and then filter down to the tag combinations you want! You can filter to match any or all selected Tags.